Secrets of Working With Investors. 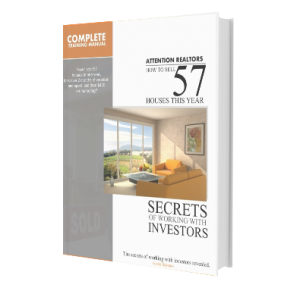 It’s no big secret that my real estate sales skyrocketed when I decided to focus on the Investor niche. I started selling a lot of real estate almost overnight. This 60+ page course walks you through my business plan, marketing plan, and automation systems. It teaches you how I started bringing in more leads than I even had time to respond to. And it talks about other value added services I was able to provide to my clients to earn even more money. This is a really good course. It tells you exactly what I did to generate over $100,000 in commissions yearly. If you have any interest in exploring the Investment property real estate sales niche, this course is the only thing you need.